Golf course living may sound like a dream to some and a nightmare to others. The truth is that it has both pros and cons that potential buyers need to consider. If you can quickly distinguish between an ideal vision and reality that is often less than ideal, you may find living in a golf course community has many perks that you find appealing. If it is your “thing”, there is something serene about having a home on a golf course. This type of lifestyle became popular in the 1980s, and now poses a viable suburban living option for many consumers. If you can deal with an occasional stray ball that finds your yard, fence, window, yard ornaments, or planted pots, then golf course living may be worth your while. 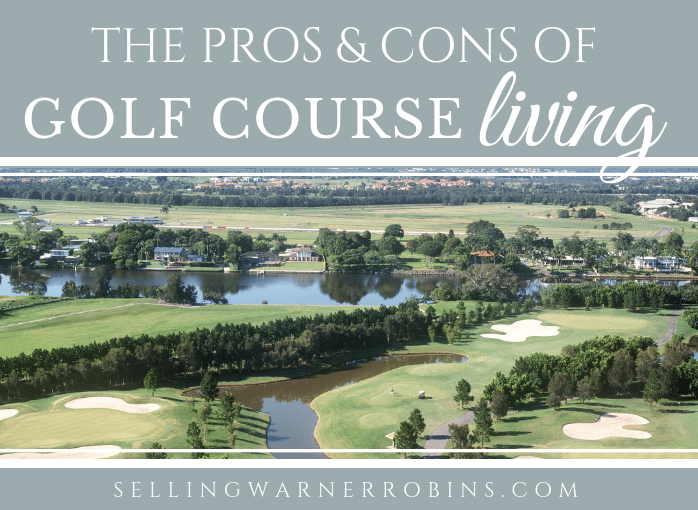 As is the case with all home purchases, it is smart to weigh all your options carefully, including both the advantages and disadvantages of golf course living before making a final decision. Here are some things you should consider. Many golf communities have age restrictions or function as retirement collectives. Many of these communities are home to active adults with an age limit of 55 or more. That means empty nesters or older couples without children know what to expect and can meet like-minded people who share similar interests and enjoy spending their time in a picturesque environment. When there is not an age restriction, the allure of playing golf as often as you can without leaving your neighborhood may be too good to pass up for some younger households. In converse, age restrictions are limiting which means many buyers will be left out. Even for golf course communities without an age restriction, it may not be the ideal locale for families with young kids. The thought of stray golf balls landing where your kids play, or a host of strangers walking/riding by daily, may not be what young parents envision for their families. 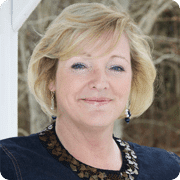 I have known both young families and older adults that have both loved and regretted their decision to make golf course living their way of life. As consumers go through the buying process, it is important to determine whether age is a factor worth considering when viewing golf course homes. If it is, it may be best to move on and find a home elsewhere. If you love golf, one of the most obvious advantages is that you do not have to drive out of your way to play. The thought of grabbing your clubs and hitting the links whenever you want is too good to pass up. With nary an inconvenience standing between you and the first tee, it is understandable the pull this can have for both duffers and decent golfers alike. Then again, homes built near golf courses are prone to wayward shot damage. Some people also report having to collect hundreds of balls that end up on their property. Others have to invest in insurance policies to protect their belongings. Some even dislike the course maintenance noise that happens periodically each week. In a nutshell, you are surrounded by golf everyday, which brings increased traffic (both through the neighborhood and outside your backyard if you live off a fairway or green). If you are thinking it may be more of an inconvenience to live that close to a golf course, perhaps something in a neighboring subdivision will work instead. It is important to note that golf facilities do not revolve just around one hobby and sport. They often include swimming pools and other amazing amenities. Usually, one can find a clubhouse that serves as a heart and soul of the community. Many have restaurants, bars, multi-purpose rooms, and fitness centers. In some higher end communities is not uncommon to see tennis courts and other facilities too. Residents who do not play golf but like the neighborhood often are able to find their forever home in a golf course community. Sometimes they are drawn by the events that take place throughout the year, ranging from Zumba sessions to arts and crafts workshops. Members can participate in all sorts of get-togethers which is great if you like things organized for you. Of course the opposite is true too…for those who do not want someone else planning their activities or DIY projects, this setting could be a disaster. Buyers who want plenty of quiet time and are not interested in socializing may find all the activity overwhelming as well. When in doubt, ask your agent for a list of what is offered in the neighborhood to determine if there is too much or just the right amount of activities for your liking. Many are not bothered by all the activity nor the increase in both street and foot traffic that accompanies living on a golf course. If you are an extrovert and/or people person, it will give you ample opportunity to meet and greet as well as make new friends. For these folks, privacy will not be an issue as they look forward to visiting with others whenever possible. Security is not a concern for many residents either as the level of trust among neighbors can be high. If you and your neighbors are vigilant and watchful, the risks of having an incident are decreased. Add in golf course security and grounds personnel who are often out-and-about and there is another built-in layer of safety for residents. For those living in a gated community the risks go down even further. However, a lack of privacy can be a real issue for some buyers. Being adjacent to the tee box can allow others to take a peek inside your home or garden. The more people around the less privacy you will have…no one wants to keep their blinds drawn all day if there are wonderful views. Some golf communities offer more privacy and tranquility than others, suggesting you should really know what you are getting yourself into. Do not be fooled by alluring pictures. Go and visit a particular community. See if it is too much of a hassle for you to cope with all the traffic, carts beeping, and leaf blowers roaring. Most people look for a quiet community, but that is not always the case. Environments that do attract younger people can be rowdier than those that are age-exclusive. Nonetheless, having your home next to a cart path faces you with frequent noise. Others argue that the bigger problem lies elsewhere: there are multiple security loopholes that may pose a threat. Indeed, the level of trust among neighbors is high, but wealth attracts criminal activity that can stem from both within and outside the neighborhood. Therefore, experts recommend homeowners to invest in solutions such as sturdy security doors and video surveillance systems if the homeowners association allows them. Safety and security should never be taken for granted, regardless of the setting. One other crucial aspect is related to homeowners association restrictions. Namely, where maintenance and modifications are out of your hands as the homeowners association handles home management, repairs, and renovations. Consequently, homeowners are not given complete freedom when it comes to aspects like exterior paint color or fencing options. Sometimes they are also prevented from putting swings or other exterior items in their yards. On the plus side, you have less on your plate in terms of maintaining the property and organizing your life. You can reap the benefits without worrying about home maintenance upkeep. For some people, that is a win-win scenario. If you do not have to take care of the landscaping, enjoy the benefits of not having to work your yard in the heat of summer. Nature often abounds at golf communities and wildlife pays a visit from time to time. The beauty of it is that you will not be investing any time and effort, as others will do it for you. 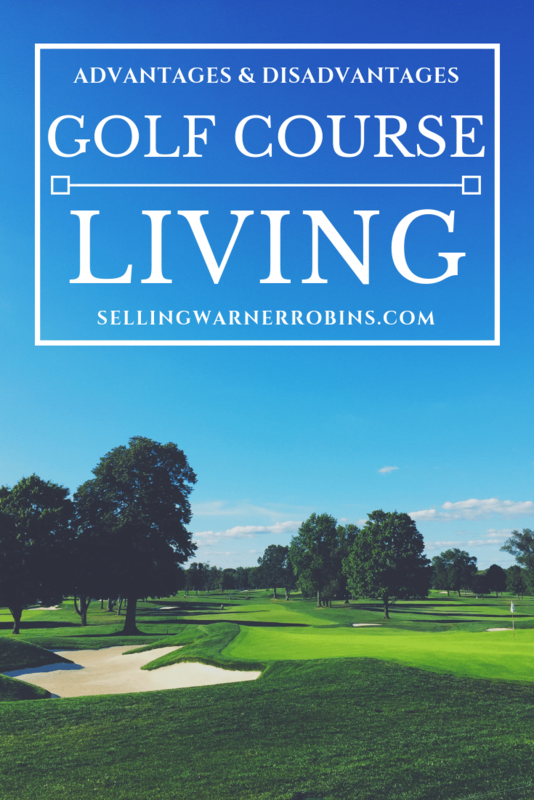 Besides, a property situated around a golf course often has a high resale value. After all, it features a pleasant atmosphere and a spectacular view, often being surrounded by various amenities. Finally, there is also prestige included when you live in such an upscale environment. Just remember that a down economy can prove to be devastating and many golf courses have gone under in the recent years as a result. Golf course living is an inviting proposition. I recently had lunch with a former buyer who mentioned the next (and last) home they purchase will be on-site or near one of the Houston County golf courses. I look forward to assisting them when they are ready. Even people who do not fall under the group of golf aficionados find out that these well-organized, beautiful communities grow on them. Still, this kind of lifestyle is certainly not for everyone and prudent buyers will do their research before committing. Do you like the idea of feasting your eyes on a breathtaking view of a manicured golf course while playing a few holes on a whim? Ultimately, it comes down to what floats your boat. It is your call to figure out whether the advantages outweigh the disadvantages of golf course living.